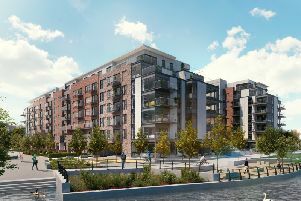 A proposed £120 million development at the Fletton Quays site in Peterborough is not good enough for the city and needs a re-think, according to the Peterborough Civic Society. “The regeneration of the large derelict area, known as Fletton Quays, is long overdue. Peterborough Civic Society was therefore excited when serious proposals for major development were made public. “Sadly the development scheme set out by the Peterborough Investment Partnership lacks vision and ambition in both its fundamentals and details. As presented it will not give this neglected part of Peterborough the major transformation it has long been waiting for. “Over the last 20 years residents, businesses and voluntary agencies have given their time and experience to considering the many ideas put forward for this site. “There have been numerous presentations, exhibitions, questionnaires and workshops where many aspects, from ‘Vision’ to precise details have been explored. “The superb location, unique river frontage, extensive views of the whole of the south elevation of the Cathedral and the chance to incorporate heritage industrial buildings of some scale within the site still offer an opportunity to create something unique and special for Peterborough. “Previous plans have included: an art gallery, concert hall, conference centre, hotel and university campus as well as the whole cast of supporting facilities - restaurants, bars and niche retail - with good car, bus, cycle and pedestrian access. “In other words the scheme should be something which would be of great benefit to the people of Peterborough and attract people from a wide area to visit and stay awhile; a marvellous new asset further enhancing Peterborough. “So what is now being proposed? A scheme which comprises residential apartments, offices, an hotel and a truncated, poorly connected riverside walkway. Where is the magnet that will attract visitors to the area? “The proposal has no committed use of the railway heritage buildings, the 19th century Whitworth Mill is not included in the site, the much lauded ‘iconic’ foot bridge cycleway is not to be built at this time, the link to the Abax Stadium is omitted and the connection of the riverside walk is weak at both ends. Moreover there is no quay in Fletton Quays. “Any application approval must make financial and safeguarding measures to enable and assist the future incorporation of these features which will transform the development from an ordinary commercial scheme into a flagship visitor attraction. “There are grounds for refusing the application based on adopted planning policy and guidance. However, the real power here lies in the hands of the City Council as owners of the land involved. “Our elected members have the final say in the development of this, the premier site in Peterborough.